Bob Phillips, the host of the “Texas Country Reporter,” is honored with a star on Waxahachie’s Walk of Fame during a previous Crossroads of Texas Film Festival. Wood craftsman Phil King demonstrates his handmade wine stoppers during the “Texas Country Reporter” Festival. feature on our television show have an interesting knowledge about a particular subject that is far more detailed than we have time in a six or seven minutes. Some of those people we have invited to come to the little pocket park there around the square,” Phillips said. “There will be five different ones that are going to be there throughout the day. “I hesitate to call it a lecture series. It is more of discussion. They are going to be presenting their subject and talking about it. There is a forensic sculptor for instance named Amanda Danning that is coming. 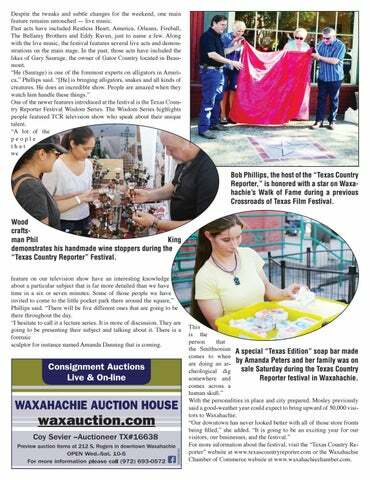 This is the person that the Smithsonian A special “Texas Edition” soap bar made comes to when are doing an ar- by Amanda Peters and her family was on sale Saturday during the Texas Country cheological dig Reporter festival in Waxahachie. somewhere and comes across a human skull.” With the personalities in place and city prepared, Mosley previously said a good-weather year could expect to bring upward of 50,000 visitors to Waxahachie. “Our downtown has never looked better with all of those store fronts being filled,” she added. “It is going to be an exciting year for our visitors, our businesses, and the festival.” For more information about the festival, visit the “Texas Country Reporter” website at www.texascountryreporter.com or the Waxahachie Chamber of Commerce website at www.waxahachiechamber.com.